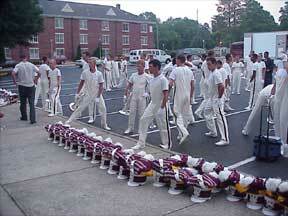 Alan Horne, whose son, Alan, is the lead trumpet player for the Cadets, submitted this one of that corps stretching in a parking lot before a performance in Jacksonville, Ala. Alan is the dark-haired gentleman with one foot up on the curb in the center of this photo. Thanks! We're running low on Forzato pics! E-mail your submissions -- and we will get to them all, in time -- to dave@dci.org along with where and when the photo was taken. Send some biographical information about yourself as well. We'll give you full credit. Also, let us know if you want your e-mail address included, to get feedback from other drum corps fans.